To many people, Kelantan seems mysterious and remote from the rest of Malaysia, both physically and metaphorically. A car journey to Kota Baru (to the locals, simply ‘KB’) from Kuala Lumpur takes about 8 to 10 hours. As a result of PAS’s long rule in Kelantan, many outsiders believed that Kelantan is an Islamic state through and through. BN’s scaremongering of Kelantan as a theocratic state has caused many to view its non-Muslim population with pitiful and sympathetic lenses, deprived of their freedom to practice their lifestyles (‘no pork, no booze, no music, no fun’ goes the quip). Kelantan’s non-Malay population forms about 5 percent of the population, with the Chinese being the biggest group, at 3.6 percent of the population, while Malays form 95 percent of the total state. Kelantan’s Chinese are mostly concentrated in and around KB, primarily engaged in commerce and trading activities. Many of the Chinese restaurants here still display Chinese signboards and liquor advertisements prominently on their business façade. Aside from the many Jawi language signboards, KB is no different from any Malaysian towns. As dusk sets in, its eateries -Muslims and non-Muslims- are just as packed and lively as other places. There are many Chinese restaurants, coffee shops and pubs that dot KB, except that they are strictly for non-Muslims. Kelantan folks are a friendly lot too; I often saw them smiling at strangers. The non-Malays are conversant with the local Malay customs; the non-Malays often greet each other in the traditional Malay pleasantries. The Kelantan society truly lives out a one Malaysia spirit. In this opposition-run state, the ethnic groups are treated fairly and have equal standing. It is easy to see why Kelantan folks interact and embrace each other easily. 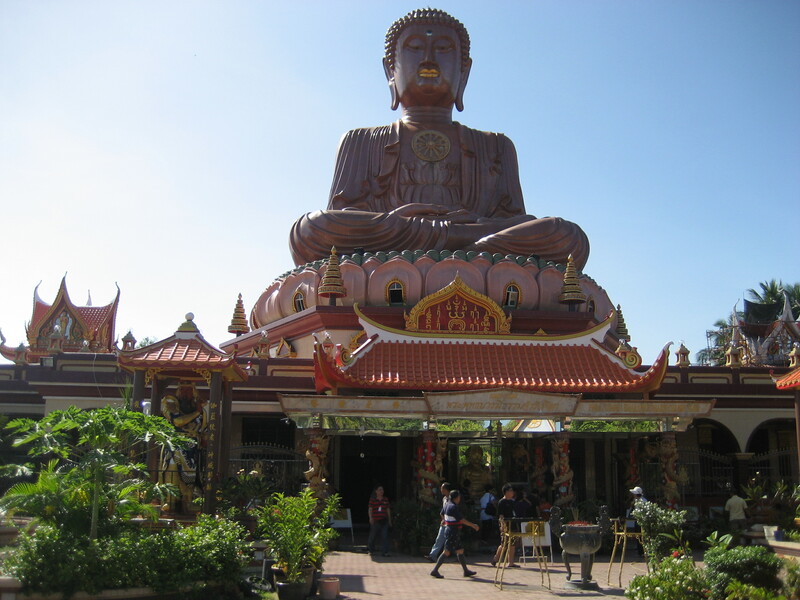 Kelantan has the biggest sitting Buddha statue in the entire South East Asia. To many outsiders, women are perceived to have no status in Islam. In Kelantan however, the womenfolk more than hold up their own. In KB’s biggest wet market, the Siti Khadijah wet market, women are the ones running the businesses. Kelantan women are gentle yet capable, as evidenced from their thriving entrepreneurship and ability to take care of their families. Another common misperception about Kelantan is that due to strong Islamisation, there is forced segregation of the sexes in public areas. However, on my observation most people ignore this ruling in their daily lives. In many supermarkets and shops, there are signboards being hung requiring the people to line up according to their gender. There are also queues for families. However, for the other queues the people line up without regards to the regulations. 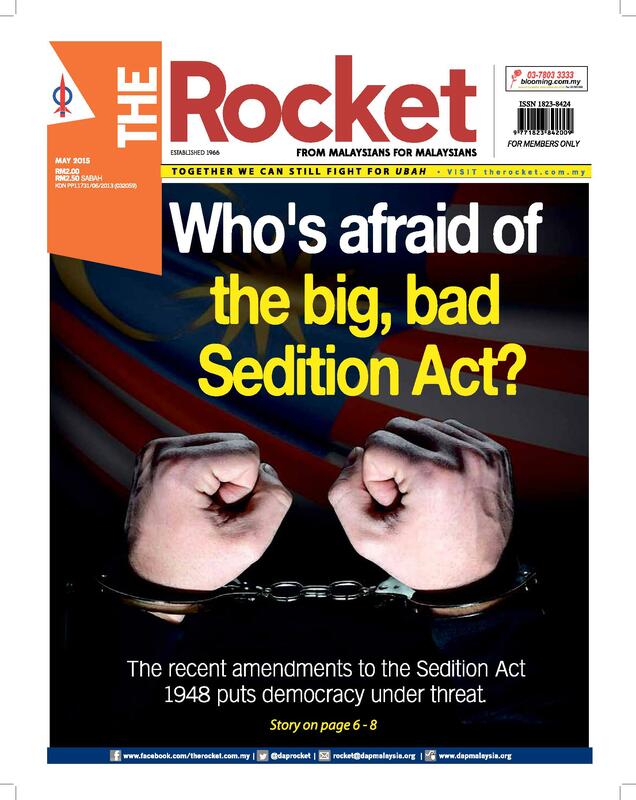 Even the Malays don’t have much regard for this regulation. Another common myth about Kelantan is because it is governed with a theocratic bend by PAS, it lacks development and as result has a lot of poor people. Hu Pang Chaw, PAS Supporters’ Club (DHPP) chairman countered that the people in some of the other states that have oil and gas resources that are under BN’s governance are even poorer than Kelantan. According to the official statistics released in 2009, the states with the highest poverty rates are: Sabah, Perlis, Sarawak, and Kedah at third place and Kelantan, fourth place. Terengganu is fifth. Kelantan Chinese Assembly Hall (KCAH) advisor Lau Chit Fang said that even though Kelantan produces oil, its state government has not received any oil and gas royalty from the federal government. “Even though Petronas’s oil rigs are located within 140 km of Kelantan’s shore, its oil is transported 300 km to Terengganu. What is their motive for doing so? This is why the state government is launching a movement to demand back the RM 10.4 billion oil and gas royalty due to Kelantan,” Lau said. In a radio interview, Hu also revealed BN’s biasness during its tenure in Kelantan. “In one particular year in the 1980s, when the state government held coronation celebrations for the Sultan, it erected an archway which had Chinese characters. However the Chinese words were covered up due to pressure from certain quarters. 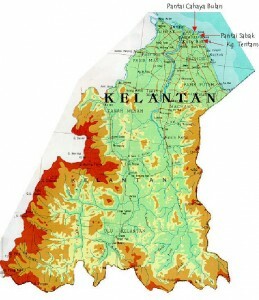 Around 90 percent of Kelantan’s private land is classified as Malay reserve land, which cannot be sold to non-Malays. Certain parties have used this issue to attack the state government. In my interview with the KCAH chairman Oie Poh Choon, he said that during BN’s 12 years reign, he had applied many times for land titles for his private properties but was rejected. “This policy is applicable not only to the non-Malays but out-of-state Malays too. Only the Kelantan Malays are allowed to acquire this land freely. In any case, there is also Malay reserve lands in other states too. However, the PAS government has allowed non-Malays and out of state Malays to buy these lands,” Oie elaborated. In an interview with a local radio station Durian FM, Hu said that many Chinese private-owned lands were acquired by the BN state government during the 1980s for development purpose. 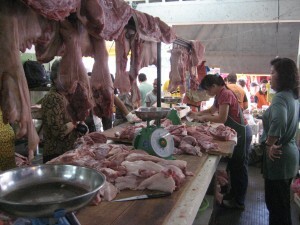 Pork is sold openly in KB, unlike in many other states in Malaysia, testament to Kelantan’s tolerance of its minorities. On one of my visits to a wet market in KB, I saw pork stalls being located nearby the PAS state headsquarters and taxi stalls, openly displaying their wares next to a roadside wet market. The pork stalls are concentrated in an area just beside other shops. The Muslim and non-Muslim stalls are side by side each other. Many Muslims would walk nonchalantly past the pork stalls to enter the wet market. Some Muslim traders even came up to the pork stalls to exchange money, without apprehension. In the pork shop, there are three main stalls where nine operators rotate weekly to sell their products. This is unlike other states where pork stalls are only open for six days in a week and are often confined to a hidden and walled corner, far from people’s sight. This article was written by admin on Monday, January 7, 2013 at 12:41 pm. You can follow any responses to this entry through the RSS feed. You can leave a response, or trackback from your own site. I am not surprised at all. From my early visits to that state I have always found the locals there very friendly , prgressive and indeed very easy to interact with outsiders. It is the politicans from outside that have created the perspection that they are backward. This brings me to the ‘Allah’issue. We, the non Muslims, should just leave this issue to be resolved within the PKR and I am sure that can be done easily. I congratulate the writer for a good article. I was born and bred in Kelantan. I agree and concur on what is being written. I went to kb on a working trip last year. I went for breakfast at restoran kita, a famous outlet opearated by a chinese family and from the photos adorned on the wall, that place is popular with both locals and people out of state. I saw many pretty malay girls without tudung too. Next i went to restoran jin man lou and had (surprise, surprise) bakuteh ala klang style, complete with pork tendon, ‘big bone’, belly and intestines. I went to tesco (one and only hypermarket) and paid for some mineral water… Mind you, no queue segregation. Again i could not help stealing glances at pretty malay girls without tudung. At night, i went to a local chinese coffeeshop and ordered my favourite hokkien mee complete with pork lard and washed down with a bottle of carlsberg. PAS infringing on rights of minorities? No, not that i experienced first hand. As a muslim, I should not be highlighting the forbidden activities like pork eating, beer drinking, Malay girls not covering aurat. I think nobody should be promoting the forbidden activities out of respect for the Muslim population who have shown tremendous tolerance. The recent well development & improvement of states like Penang,Kelantan,Selangor, Perlis & Kedah managed by opposition parties should be shared with non-bumi more widely through internet so that more non-bumi can understand more about how well the opposition parties had done so far. My husband & I love to drive to KB using the East West Highway. We have such pleasant and fond memories of Kelantan. I remember my first trip there being very apprehensive of all we read in the papers! But we enjoyed the friendliness of the locals and their kindness. Thank you for this well written article telling the real story of our east coast state.